Wedding Inspiration - enhance your paper decorations with ribbon! Create your own unique and one-of-a-kind impressive wedding decorations on a budget. If you like the look of paper lanterns and pom poms here's a way you can make them look even more amazing! 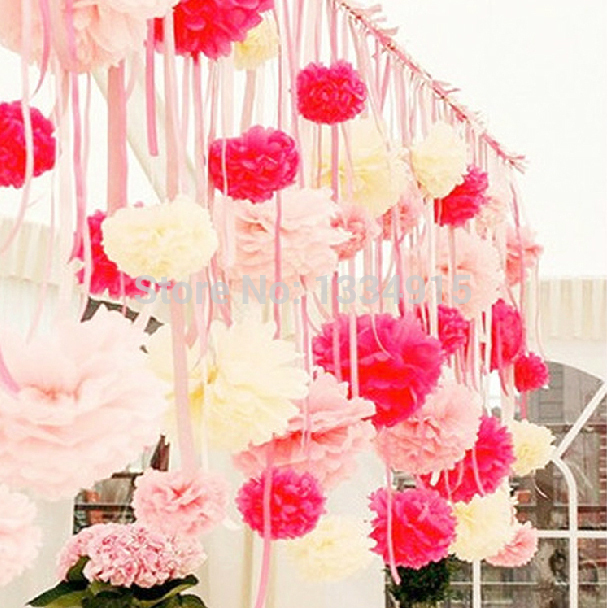 Add a little extra colour and flair to your lantern and pom pom decorations. Its easy to do and economical. By adding some ribbon, hanging above or below your decorations will enable you to add more colour, depth and texture. Hang long ribbons to add extra volume and height to your displays. 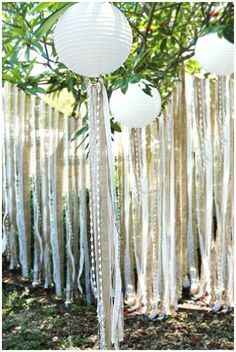 Paper lanterns, pom poms and ribbons will make a stunning wedding backdrop. 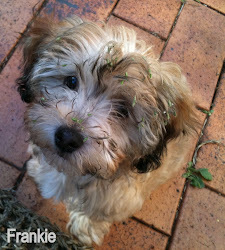 Create a one-of-a kind to suit your personal colour theme! Create a little extra excitement to your hanging table cluster decorations in co-ordinating or contrasting coloured ribbon. Hang outdoors - for even more texture add paper pom poms and ribbons to your clusters! 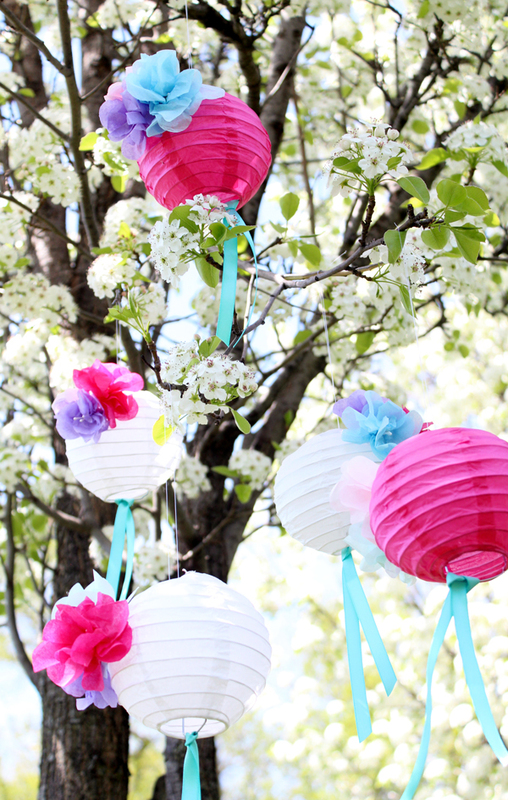 Combine paper lanterns, pom poms and ribbons for extra colour and texture! 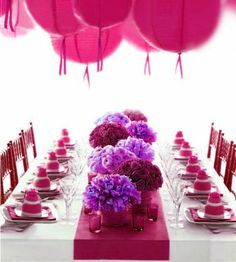 Creating your own personalised wedding or party decorations to suit your colour scheme or theme is easy - we have over 40 colours in our range of lanterns, pom poms and ribbons. 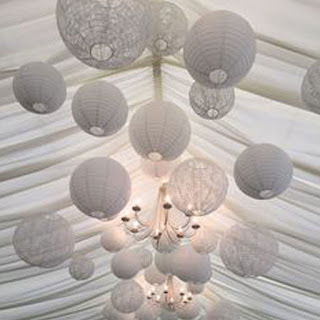 Our new lace lantern has got everyone talking - event planners, wedding planners, brides and reception venues are all going crazy with excitement over these beautiful lanterns! Add that romantic feel to your garden wedding, hang indoors or inside a marquee. Team with some fairy lights! Decorating tip: hang lanterns in clusters in chandelier style with our crystal droplets hanging below the lanterns. 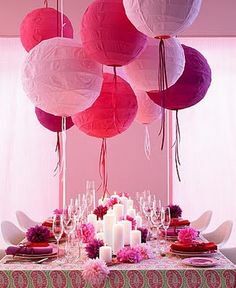 Hang with our white organza or satin ribbons to add extra effect, or hang with our clear hanging line if you want the lanterns to appear as 'floating bubbles'. 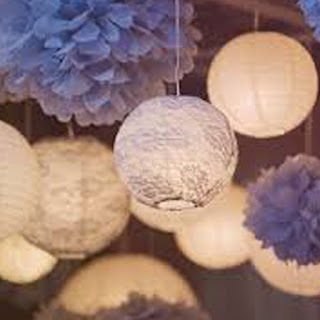 Team with our regular paper lanterns or pom poms for added textures and colours! 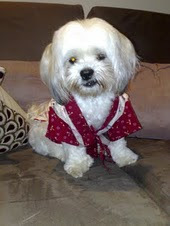 Custom-made from cotton LACE fabric. Elegant, soft yet sturdy real lace lantern. Stunning lantern with intricate detail for weddings, high tea parties and special events. For evening events, these lanterns can be illuminated with our lantern lights (sold separately). 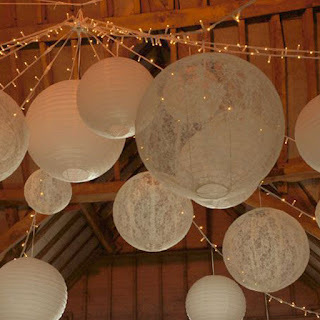 Or hang among our fairy lights for a whimsical feel. 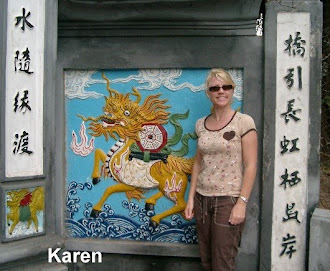 Economical decorations, these lanterns fold flat again after use, so you can use them over and over again. Great for event planners, venues and restaurants!